9th December 1608, London, England. 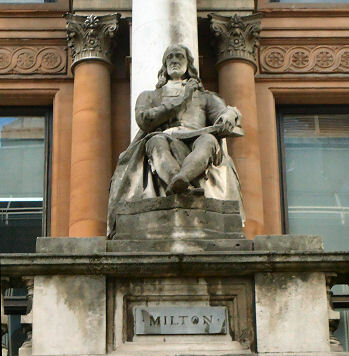 John Milton was the son of a scrivener and composer. St. Paul’s School, London. Christ’s College, Cambridge. 1632: Milton leaves Cambridge University and moves back to his father’s house at Horton in Buckinghamshire. 1634: Performance of “Comus” at Ludlow. 1638-39: Milton embarks on a tour of the continent, through France, Italy and Switzerland. 1640: He teaches at a school in London. 1641: Milton begins writing anti-Episcopal leaflets. 1642: Beginning of the English Civil War in October. 1649: Execution of King Charles the First on 30th January. In March he is appointed Secretary for Foreign Tongues to the Council of State. Becomes totally blind. 1658: Death of Oliver Cromwell on 3rd September. 1660: Restoration of the monarchy in May with the return of Prince Charles as King Charles the Second. Milton arrested and then released. 1665: Milton lives in the countryside at Chalfont St. Giles to try and escape the plague. 1628: “On the Death of a Fair Infant dying of a Cough”. 1638: “Lycidas.” “Justa Eduardo King”. 1641: “Of Reformation in England”. 1649: “Eikonoklastes.” “The Tenure of Kings and Magistrates.” (a defence of the Regicides). 1651: “Defensio pro Populo Anglicano”. 1659: “A Treatise of Civil Power in Ecclesiastical Causes.” “Likeliest Means to Remove Hirelings out of the Church”. May or June 1642 to Mary Powell. (died 1652) November 1656 to Katherine Woodcock. (died 1658). February 1663 to Elizabeth Minshull. 8th November 1674, Chalfont St. Giles, Buckinghamshire, England. St. Gile’s Church Without Cripplegate, London Wall, London, England.